WoodsApp is map based forest information system, where user can utilize search engine that enables finding ideal forest compartment according to user-specific requirements. All Finnish-wide open forest stand data by Finnish Forest Centre is available to your organization. WoodsApp will bring significant benefits for timber buyers, forest service providers and forest owners associations. The service is effective tool for searching timber trade or silviculture targets, the new customer acquisition of the forest service business and the purchase of forest property. With just one click, you can see area, main tree species, development class, cutting potential, action proposals, and other information related to the forest stand. 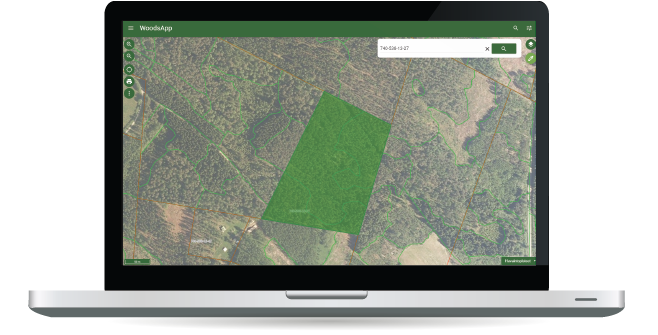 In addition to open forest stand data, useful background and theme maps are available to your organization. These maps can help you to find important natural habitats or evaluate cutting potential. WoodsApp’s mobile features are splendid. Service works effortlessly on both mobile device or tablet, when you are searching suitable wood trade and silvicultural work units. WoodsApp Forest Information System is smart tool for the best timber trade, silvicultural work and real estate trade units. Access to country-wide open forest stand data. WoodsApp solution offers versatile and high-quality background maps and spatial datasets. WoodsApp is light and responsive solution, so it is perfect for field work. WoodsApp is combination of excellent usability and versatile country-wide data. Service already has more than 400 professional users. With WoodsApp Forest Information System it is possible to search forest stands by using several search criteria, make observation and collect data on the field or search destination by either address or real estate ID. As a license holder of WoodsApp-service, you will have access to wide range of map layers and spatial data. All functions are available without limitation.